Jurassic Park, a Microgaming online video slot based on the pre-historic theme, features several varieties of wild symbols, plenty of free spins, and generous payouts. Microgaming’s Jurassic Park has 243 ways to win and a minimum fixed bet of $0.30. Players can bet up to $15.00. The top fixed jackpot is 1,500 coins, but players can win plenty of coins in the slot’s bonus features. Playing Jurassic Park is as easy as placing the bet, spinning the reels, and collecting payouts if a combination of winning symbols is displayed on the reels. Jurassic Park is the first online video slot, in which Microgaming has incorporated its Parallax Scrolling technology. 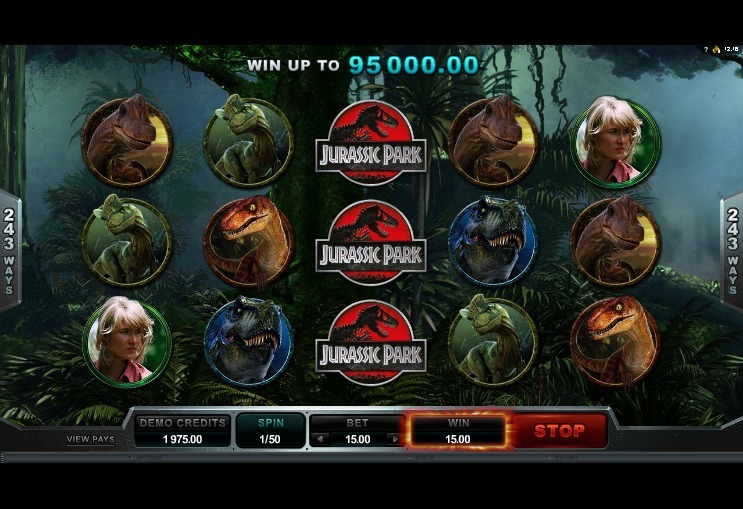 Based on the movie Jurassic Park, the slot features authentic movie sounds, graphics, and animations, making players feel as if they are watching the movie all over again. The reels feature familiar icons of pre-historic creatures and the reels are set in the backdrop of a lush jungle. While playing the base game, the T-Rex Alert Mode Feature can get activated. Once triggered, the feature remains alive for six spins. T-Rex appears behind the reels and as many as 35 wild icons are introduced on the reels, helping players win really big amounts of cash. The Dinosaur Egg serves as the scatter. These icons appear scattered all over the reels, helping players win incredibly large scatter payouts. If players land at least three scatter symbols anywhere on the reels, the free spins bonus round gets activated. This feature comprises five different free spin rounds, each with mystery multipliers, wild reels, wild multipliers, split wilds, running wilds, and winning wilds. When players activate the free spins round for the first time, they will get the T-Rex Free Spins Bonus Round. The other free spins rounds will get activated once players activate the free spins round a specific number of times. The T-Rex Free Spins Bonus Round comes with wild reels. In addition, up to three T-Rex symbols appear stacked on all the reels. Whenever a T-Rex appears on the reels, it can transform all the reels into wilds. The Velociraptor Free Spins Round comes with wild multipliers or split wilds. If players are lucky enough to get a split wild, they can claim payouts for winning combinations of six symbols. If they get a multiplier wild icon, they can win multiplier values of up to x6. If players unlock the Brachiosaurus Free Spins Round, they will get a mystery multiplier, in which a multiplier value of up to x6 will apply to several free spins. The Triceratops Free Spins Round comes with running wilds, re-spins, and random stack nudges. The Dilophosaurus Free Spins Round comes with winning wilds. Jurassic Park is available for fun or real money at any Microgaming-powered online video slot.